How to Know If you Are Overweight Or Not! Before you go out there and start doing exercise, its very important that you tell if you are overweight or not. Now, if you are reading this article, you might say…erm…but my friends or my partner told me that I am now fat, so I really want to lose weight. The truth is, wether you are fat or not is not dependent on what your friends said to you while you met at the market last weekend or what your partner said the last time you were in bed together. There is a very simple formula that is used commonly by those in the medical profession to determine if you are truly overweight or not. And unless you know for sure that you are overweight or not, do not bother to undergo any weight loss routine that will make you lose weight, instead of routines that will help you maintain your present age bracket. Its called the Body Mass Index (BMI). This term is actually internationally recognised by the World Health Organisation (WHO) as a formula for classification of weight. The body mass index is the ratio between your body weight and your height. Step 1 – Measure yourself on a bathroom weighing scale. If you don’t have this, go to the nearest clinic or Gym to use theirs. Step 2 – Take a measurement of your height using a tape calibrated measurement in meters and ask someone to help you take your measurement. So, let’s assume you weight 75Kg and you height is 1.85 Meters, here’s how you will calculate your BMI. 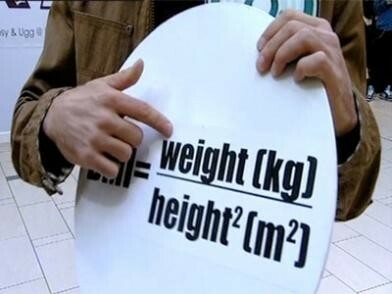 Obesity: BMI range is anything greater than 30KG/m2. So if you are not sure if you are overweight or not, I want you to take the above steps and use it to measure your own BMI. Also, if you don’t want to work this out manually, you can use the BMI calculator that is to the right hand side of this article (In the sidebar) to do it automatically. Make sure you know your BMI before you take the next step towards losing weight or maintaining it. Once, you’ve calculated your BMI, I want you to write a comment below letting me know what your BMI is and the classification (Normal, Overweight or obessed). Seriously, I want you to leave a comment below. If you have enjoyed this article, make sure you share it with your loved ones and friends by sharing this page with them via email or Facebook. 2 Nigerian Foods That Causes Belly Fat! Do You Keep A Food Diary?